Celebrate these very special family members with this theme?s games, crafts, decorations, circle time suggestions, and new rhyme. Puppets, word flashcards, activity sheets, a bingo game, a new scrapbook page, coloring pages, and so much more! 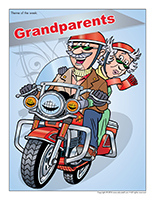 (Open thematic poster-Grandparents) Print, laminate, and display all kinds of posters. (Open educa-decorate-Grandparents) Print, cut out, and laminate. Use the items to decorate the walls of your daycare and set the mood for the theme. Cut a large tree trunk shape out of brown construction paper. Trace each child's hands (one hand for each of his/her family members) on green paper. Help them cut out the shapes and glue them above the tree trunk. Write a different family member name on each leaf (hand). Select a shape that you especially like (star, moon, heart, animal, etc.) and trace it several times on pretty paper. Cut out the shapes and glue a picture of a family member of a child in your group on each one. Use string or ribbon to hang the shapes from a clothes hanger or branch. Variation: Simply display pictures of the family members of the children in your group on the walls in your naptime area. This special tool was created in response to a special request received. 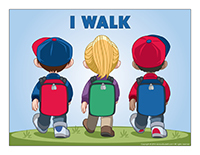 (Open poster-I walk) Print and laminate to encourage children to walk in your daycare. Show children black and white pictures and explain how, when their grandparents were young, color photos did not exist. Invite children to bring several pictures of themselves at different ages to daycare. Display each child's pictures in the form of a ladder, with the most recent pictures at the top. Help children realize how quickly they are growing. Can you name your grandparents? Do you have special names for your grandparents (Pops, Granny, etc.)? What do you like to do most with your grandparents? Do your grandparents live close to you or far away? (Open picture game-Grandparents) Use the pictures to decorate your daycare or to spark a conversation with your group. Print, laminate, and store the pictures in a Ziploc bag or in your thematic bin. 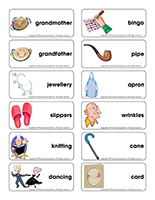 (Open writing activities-G like grandparents) Print for each child or laminate for use with a dry-erase marker. (Open educa-nuudles-Grandparents) Print for each child. Have children color the sheet. Once they are done, they may use Magic Nuudles to turn the coloring pages into three dimensional works of art. 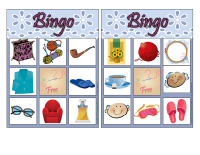 Variation: If you do not have Magic Nuudles, ask children to fill the spaces designed for Magic Nuudles with bingo markers or stickers. To order Magic Nuudles. (Open stationery-Grandparents) Print. Use the stationery to communicate with parents, in your writing corner, or to identify your thematic bins. 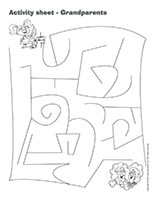 (Open activity sheets-Grandparents) Print and follow instructions. 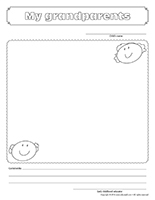 (Open observation sheet-Number 2) Print for each child or laminate for use with a dry-erase marker. Use the cards to spark a conversation with your group or in your reading and writing area. They may also be used to identify your thematic bins. (Open word flashcards-Grandparents) Print. 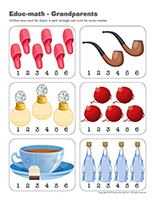 grandmother, grandfather, jewellery, slippers, knitting, dancing, bingo, pipe, apron, wrinkles, cane, card. (Open game-antiques) Collect several antiques or print the pictures and use them to explain how several modern items have changed a great deal over the years. (Open picture clue story-My family) Sit in a circle with your group. Begin reading the story and pause every time you reach a picture clue. Point to the illustration to help children guess the missing word. 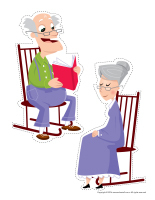 Invite children's grandparents to come tell a story to your group before naptime. They can simply speak to your group about how things were when they were younger. If they prefer, they can read a book. Take advantage of transition periods to sing with the children in your group or play different types of music (from very old music to today's most popular sounds). Collect several different pictures of adults of various ages. 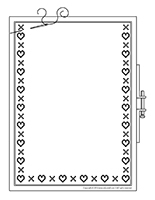 Arrange them in a small photo album or laminate them and use a metal ring to hold them together. Use the pictures to spark a discussion about grandparents with younger children and encourage children to admire the pictures again and again. Ask parents to provide pictures of their child's grandparents. Use adhesive paper to display the pictures on a wall, at children's eye level. Have children sit in a circle on the floor. Name a child and roll a ball towards him/her. When the child receives the ball, he/she must say, "My grandmother (or grandfather) is special because..." He/she must complete the sentence by naming a characteristic or trait that he/she appreciates. Touch children with a special wand to transform them. They can become a baby, a child, a parent, or a grandparent. Encourage them to move about or act out actions associated with the corresponding life stage. Pick a child who will act out various actions regularly performed by grandparents. The other children must mimic his/her every move. Explain how, when their grandparents were young, they didn't have many toys and therefore had to play with everyday items. Deposit a large bowl filled with colourful buttons in the centre of the table and invite children to thread them on pretty string or ribbon to make simple necklaces. 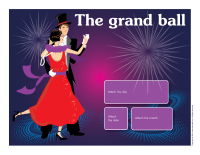 (Open perpetual calendar-The grand ball) Organize a grand ball, just like in the old days. Invite children to wear their fanciest clothing and play classical music. Encourage them to dance around the daycare together. Send invitations to grandparents who will be happy to join you, show off their dancing skills, and reminisce or tell stories. Pick a child who will play the role of a grandmother or grandfather who really enjoys giving hugs to others. The goal of the game is to hug every child. Once a child has been touched, he/she must remain perfectly still and let the other child hug him/her. Once a child has been hugged, he/she cannot move until everyone has been hugged. The last player to be hugged becomes the grandmother or grandfather for the next round. Gather several dresses, bowties, jackets, etc. Invite children to use the items to dress up as if they were attending a fancy ball. Show them how to dance the waltz and encourage them to invent original dances. Organize a special lunch (cold buffet) and invite grandparents to join you. They will be happy to spend this time with their grandchildren. Take pictures of each child with his/her grandparents. 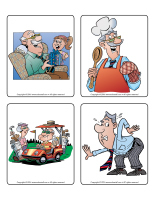 Print the pictures and use them to prepare thank you notes that can be mailed to grandparents. If there is a retirement home close to your daycare, visit it with your group. (Open educ-same and different-Grandparents) Print and laminate for durable, eco-friendly use. Children must circle the illustration that is different in each row. (Open educ-math-Grandparents) Print and laminate for durable, eco-friendly use. 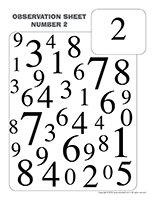 Children must count the items in each rectangle and circle the corresponding number. (Open educ-big and small-Grandparents) Print and laminate. Children must place the illustrations in the correct order, from smallest to biggest. (Open bingo-Grandparents) Play bingo with your group. If you wish, invite grandparents to join you. Print, laminate, and store the game in a box or Ziploc bag. (Open association game-Family) Print, laminate, and cut out the cards. Ask children to associate each item to the correct family member. 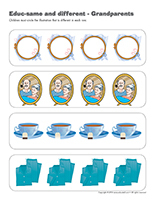 (Open story and memory game-Family) Print, cut out, and laminate the cards. Place them face down on the floor. Children take turns picking three cards and using them to invent a story. (Open hunt and seek-Family) Print and laminate. Children pick a card and search for the item in the scene. Fill a large chest with clothing items, shoes, hats, and jewellery. Let children use the contents of your chest to dress up like grandparents throughout the theme. Show children how to say the words "grandmother" and "grandfather" in different languages. Reuse empty pill bottles. Ask grandparents and parents to collect them for you. This list of activities is far from complete. Feel free to share any other ideas you may have with us. Miniature exploration bottles that can be used to create an exploration bin. Simply fill them with tiny objects and seal the caps with hot glue. Melt the bottles to create unique beads that can be used to make necklaces, pins, or keychains. Use them to create tiny animals. The bottles can represent shells. Add pipe cleaners that will become legs or antennae (butterflies, ladybugs, etc.). Insert tiny objects and hide them in the snow for a fun treasure hunt. In each bottle, add a cotton ball that to which you added a few drops of an essential oil or perfume. Make holes in the caps and encourage children to explore the scents. Use them for a simple prehension exercise (discrimination of each finger). Cut a slit in each cap, much like a piggy bank. Provide paperclips and encourage children to insert them in the bottles one at a time at first. You may also give them four or five paperclips and show them how they can move them around in their hand to be able to insert them with their fingertips. Replace building blocks with empty pill bottles of all sizes. 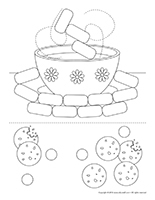 Use the lids of various pill bottles to explore the "ascending and descending" concept. Fill a large container with several empty pill bottles and let children manipulate and explore them. Watch closely to see how they will use them. How do flowers drink water? Ask children how they think flowers absorb rainwater. Through their petals? Their stem? Their leaves? Pour water into a glass until it is ¾ full. Add a few drops of food coloring and stir well. 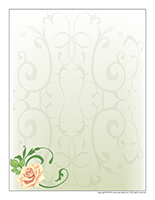 Deposit a flower in the glass. Repeat using other colors. You can use the celery sticks too. You have to wait several minutes before beginning to see the result of this experiment. Be patient! Leave the flowers in the food coloring overnight for best results. Flowers drink water starting from their lowest extremity. The water slowly travels upwards through tiny pipes in the stem. Your water was colourful, and now you have multi-coloured flowers! The principle is the same for all types of plants. Trees get water from the ground through their roots. The water travels all the way up to the highest leaves! Invite a grandmother or grandfather to come teach your group how to prepare a special meal or treat. Prepare some of your grandmother's favorite recipes with your group. For example, bake an apple pie, cookies, etc. Cut hearts out of colourful construction paper. Ask children to decorate the hearts using ribbon, glitter, pompoms, etc. Set the hearts aside to dry before writing "I love you" on each one. If you prefer, simply write the name of each child on his/her heart. Help children glue a clothespin or a magnet behind their heart. Grandparents will be proud to display this special heart prepared by their grandchild in their home. (Open models-men and women) Print several copies. 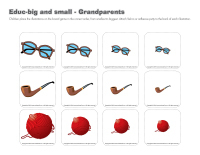 Encourage children to use the models, wiggly eyes, crayons, and yarn to represent their grandparents. (Open frame-grandparents) Print a frame for each child. Let children decorate their frame as they wish. Photograph each child individually, print the pictures, and help them insert their picture in their frame. What a great gift for grandparents! If you are planning on inviting grandparents to join you for activities during the theme, fold a piece of heavy white paper in half and let children use it as a starting point for a unique invitation card. Write the details of the activity inside each child's card and let them decorate it as they wish. Explain to your group how the first televisions presented pictures in black and white and how pictures could only be printed in black and white when their grandparents were young. Give each child a piece of white paper and a piece of black paper. Have them draw on the white paper using a black marker. Provide white chalk they can use to draw on the black paper. (Open puppets-Grandparents) Print the puppet models on heavy paper. Have children cut them out and encourage them to use a variety of arts & crafts materials to decorate them. Glue a Popsicle stick behind each character to complete the puppets. (Open scrapbook-My grandparents) Print this new scrapbook page for each child. Invite children to draw one of their favorite memories involving their grandparents. Add this page to each child's scrapbook. If the children in your group do not already have a scrapbook, visit the scrapbook section of the educatall club. (Open creative coloring-Grandparents) Print for each child. Ask children to draw an activity they enjoy doing with their grandparents. 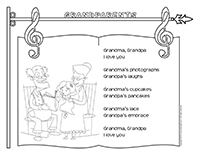 (Open coloring pages theme-Grandparents) Print for each child.